Kamisado is a game of pure reflection and strategy. The goal is to be the first to place a round of his color on one of the boxes of the opponent's base row. The trick: Players can only move one turn whose color of the symbol corresponds to the color of the box on which their opponent stopped at the previous move. Different levels of difficulty guarantee a game as exciting for beginners as for advanced players! 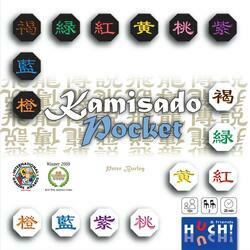 If you can not stand to deprive yourself of your Kamisado while traveling, here is a pocket version that will offer you all the sensations of the famous strategy game.